Not fit to work for social work regulator? Eileen and I met in 1991 when she began to investigate t he Islington child abuse scandal. Our first meeting was memorable because, although she came from outside London to meet me at Kings Cross station, I didn’t show up because I was so frightened. Social workers of course can be dismissed for having any contact with the media that is not approved by their employer. At the time the police were working with me to expose the child abuse scandal and Eileen played an important role in that process. While social workers avoid all contact with the media, the police know how to work with particular journalists in a positive way. Eileen and Stewart Payne (senior reporter on the Evening Standard) investigated the abuse of children in Islington for many months until the story broke in the Evening Standard in October 1992. Stewart and Eileen presented a comprehensive dossier of evidence to the police and the Social Services Inspectorate and won the Reporting Team of the Year award for the Islington investigation in the 1993 British Press Awards. 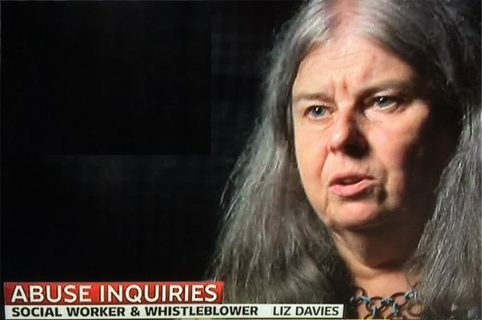 Because I was working as a child protection manager in a different authority, my name was kept out of the media until Margaret Hodge was appointed Minister for Children in 2003. The Editor of the Evening Standard then asked me if I would support the Islington survivors who were opposing the appointment of Margaret Hodge to this post. I agreed to do this because I was then working at London Metropolitan University and I was in a better position to speak with the media. Eileen and I have since worked together on over 300 stories about the protection of children. These are listed on this website. She also wrote a chapter entitled, ‘The Islington Child Abuse Scandal’ in Hunt, G. Whistleblowing in the social services. London. Hodder Arnold. Eileen taught me most of what I now know about working with the media in a safe and positive way to protect children and represent the views of those working to protect children. There has to be a safe way to draw public and political attention to the abuse of children or to professionals who are being silenced about exposing abuse. Sensitive, accurate media coverage is an important way of promoting and achieving justice for vulnerable children. Owen J (2012) Plans to cut guidance increases risk of abuse say experts. 10th March 2010: Community Care article. Liz Davies. Victoria Climbie’s social worker failed by system. Lisa Arthurworrey is registered as a social worker by the General Social Care Council subject to conditions. Gillen S (2009) Women say they were abused in children’s home. DCSF resists calls for inquiry into Kendall House case. Community Care. 9th April. Davies L (2009) Lets get rid of social work’s blame culture. Society Guardian online. 25th June. Available online. Fairweather E (2008) Birmingham council sent children to Jersey. London. Mail on Sunday. 3rd August. Peters M (2006) Climbié social worker banned from care jobs. But Lisa Arthurworrey vows to clear her name. London. Hampstead and Highgate Express. December 21st. Stickler A (2005) Today programme Radio 4: Met. Report is racist witchhunt. A met report saying that children are being trafficked into the UK from Africa and used for human sacrifice has been dismissed. 17th June. Smith C (2004) Softly Softly. New multi agency training courses. Care and Health 6th April. Davies L (2004) Why I believe in Lisa. London. Evening Standard. 6th September. Mail on Sunday (2004) Climbié social worker loses appeal. London Mail on Sunday 8th October. Waugh P (2003) Another minister under fire: call for Hodge to quit over child abuse scandal. London. The Independent 1st July. Phillips M (2003) If you had an iota of shame Mrs Hodge you’d resign now. London. Daily Mail. 12th November. The Times (2003) Ministering Justice. London. The Times. 15th November. Payne S (1999) Report on welfare findings to remain secret. London Evening Standard. 4th October. Payne S (1995) QC questions council secrecy on ‘ child abuse staff’ names. London. Evening Standard 2nd August. Rosser N and Fairweather E (1994) Ex-Islington leader to stand as MP. London. Evening Standard. 29th March. Eaton L (1993) Jack of all trades. The neighbourhood based approach to providing services has lost much credibility after the scathing report into Islington’s child care services. Community Care. 2nd September. Goodall C (1993) Boy flees kidnap bid. London. Islington Gazette. 23rd September. Lineham T (1993) A lesson for everyone. Doubts about Islington’s management structure have been justified by an investigation into borough’s homes. Community Care. Islington Gazette (1993) Social services chief quits. London. Islington Gazette. 18th November. Mowbray C (1992) Child care expert fined over photographs of naked boys. London. The Independent. 17th September.